MoleScope™ | Why put the sun in such a bad light? The negative effects of the sun on the skin are produced by ultraviolet radiation, which includes UV-A and UV-B radiation. ​​These ultraviolet rays may cause DNA damage, leading to skin cancer and premature skin aging. Sunscreen uses a combination of organic and inorganic particles to filter the UV radiation, so that less of it can penetrate to the deep layers of your skin to cause damage. Sunblock, on the other hand, utilizes the reflective properties of particles such as zinc oxide, and reflects solar radiation, thereby preventing it from reaching your skin. SPF stands for Sun Protection Factor. In the simplest terms, SPF determines how a sunscreen or an article of clothing protects your skin against the sun's harmful rays. SPF is determined experimentally by exposing human subjects to a light spectrum with the intensity of the noontime sun and comparing the amount of light that causes redness to unprotected skin to the amount of light that causes redness in sunscreen protected skin. To determine how long you can stay out in the sun with your sunscreen, just multiply the SPF of your sunscreen by the number of minutes you can usually stay out in the sun before burning. For example, if it usually takes you 10 minutes to burn in the sun, wearing an SPF 15 sunscreen will allow you to stay out in the sun 150 minutes, or 15 times longer, before burning. However, before turning yourself into a human guinea pig, we recommend that you read on and follow the advice of the American Academy of Dermatology as listed below. SPF only determines the protection afforded against UV-B radiation, the sun radiation that frequently causes tanning and sunburns. Even though some sunblocks also protect against UV-A rays, the sun radiation that may cause deeper skin damage, this quality is not reflected in the sunblock's SPF. Make sure to read the labels of sunblocks to see if they offer broad spectrum protection from both UV-B and UV-A. The American Academy of Dermatology (AAD) recommends using a sunscreen with an SPF of 30 or greater. In addition, the AAD recommends that you should apply approximately 1 ounce (about two tablespoons) of sunscreen to the sun-exposed areas of your body. Research shows that people normally apply only one half to one quarter of the recommended amount, thereby reducing the effective SPF of the sunscreen. Is wearing sunscreen with SPF above 30 better for your skin? The ability of sunscreen to protect against UV-B radiation increases logarithmically, not linearly. The implications of this is that while SPF 15 sunscreen protects from approximately 94% of UV-B radiation, and SPF 30 sunscreen protects from 97% of UV-B rays, SPF 45 sunscreen only protects from 98% of UV-B radiation. Therefore, wearing a sunscreen with a SPF higher than 30 does not offer much more additional protection than a SPF 30 sunscreen. In addition, SPF ratings do not measure UV-A protection and therefore, sunscreens with very high SPF ratings do not necessarily offer any additional protection from this other harmful solar radiation. T-shirts: SPF 6-7; Hats: SPF 3-6; Sun protective clothing: up to SPF 30. Your skin has a natural SPF which is determined by the melanin content of your skin. However, you do not want to abuse this "natural" protection because excess sun exposure may lead to DNA mutations, skin aging, and skin cancer in the long term. Can wearing sunscreen cause Vitamin D deficiency? While it is true that sunlight absorption in the skin leads to vitamin D production, there has not been any reliable evidence showing that the proper use of sunscreens can cause Vitamin D deficiency. This myth is especially proven false when one considers that we obtain the majority of our Vitamin D through food sources such as eggs and enriched milk and orange juice. Do we need sunscreen when it is cloudy outside? The answer, as you may have guessed, is yes! 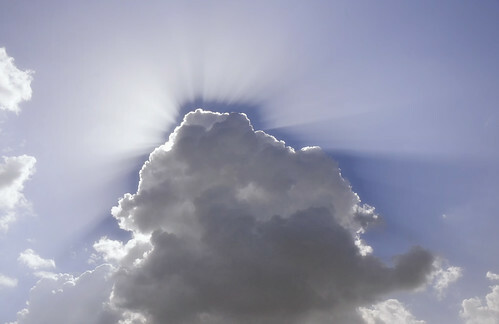 Clouds, like sunscreen or articles of clothing, prevent only a portion of the sun radiation from reaching your skin. In fact, up to 40% of the sun's ultraviolet radiation can penetrate clouds and may to either cause serious sunburns or cause long-term ultraviolet damage in people who brave the cloudy day without sun protection. We suggest that you use a minimum of SPF 30 sunscreen for everyday use. Even more importantly, we recommend that you reapply sunscreen at least every 2 hours and more frequently if you are working outside and/or excessively perspiring. Nonetheless, the greatest sun protection you can use is restricting sunlight exposure whenever possible, by staying out of the sun or wearing long sleeve shirts, hats, and other sun-protective clothing.